The upper tube assembly started this evening. 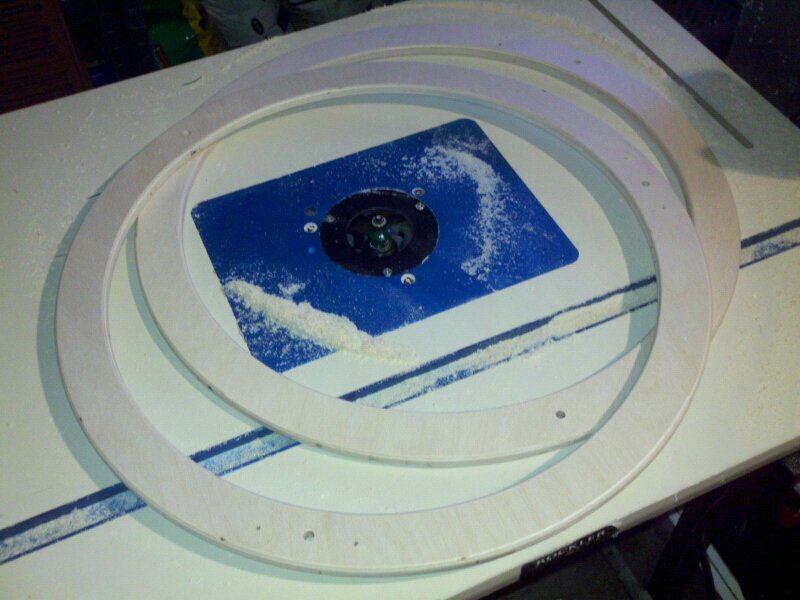 I stopped by Woodcraft and picked up a couple sheets of 1/2″ baltic birch plywood and fired up the router and cut out the rings. Also got the holes drilled. Tomorrow I plan to cut the strut tubes, focuser boards, and the UTA struts. I will go ahead and drill out the pattern for the upcoming moonlight focuser. The UTA is 1/2″ smaller than the current single ring one. This is following Kriege’s suggestion in his book. It will be a bit smaller than the mirror box, but most truss type dobs are. I also ordered some new Kydex for the UTA. In other news, I found out my neighbor is a seamstress and she agreed to make me a light shroud for the 16″. I informed her I would cut her grass a few times for payment. She agreed. ~ by jhissong on 2011/05/04.